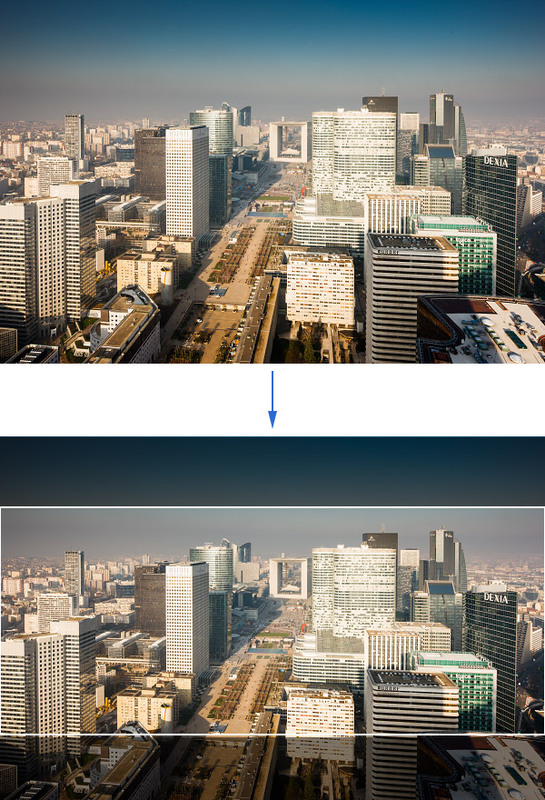 How to create a panorama ? and it doesn't allow to get big files since the photo is reframed. Large size prints are thus almost excluded. The photo is long but it lost lots of pixels and it doesn't include a wide panorama. It's the easiest and more economic way to make panoramas but a "real" panorama with big spaces is impossible! Almost all smartphones now include an app to make "real" panoramas, meaning pictures with a very wide angle of view. Certain smartphones require you to take a series of shots overlapping each other but the iPhone another original shooting mode that we'll take as an example below. 3 - Then, aim while turning slowly to the right, as it should be indicated on your iPhone, trying to hold your phone orientated the same way. It's not necessary to press the shutter release several times, unlike with other apps or smartphones. You can stop before the end of the black strip. Very handy! 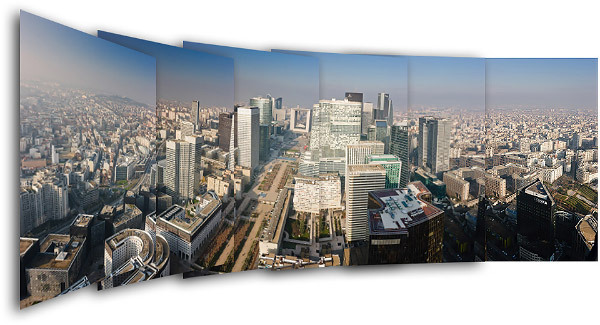 4 - Your panorama is finished and stitched! Piece of advice! You need to turn your smartphone normally, without trying to turn around the nodal point for those who know what it is. For the others, do as you naturally would while trying not to change the orientation of your smartphone during the rotation. Assets / Drawbacks - The image quality isn't extraordinary on this smartphone so your panorama won't be either. With this said, it will be good enough to illustrate a blog or a Facebook page since this panorama is still 5600x2300 pixels in size, and reduced like here, the result is completely satisfying. No extra cost, no software, no specific equipment! 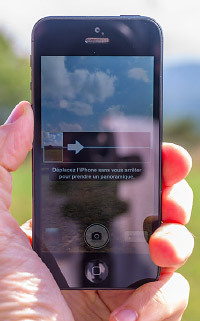 The app on your smartphone allows you to discover the joys of low cost panoramic photography! Certain horizontal lines are not perfectly lined up. 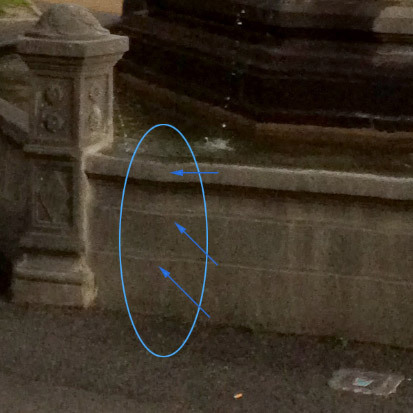 It's often the n°1 pitfall of panoramic photography, with or without smartphone. So smartphones are no exception! You should never expect a perfect result with this kind of app. Piece of advice! Then, note that you'll see numerous lines that "should be" horizontal in "real" life get curved in panoramic photography when the field of view becomes very wide. That's part of the attraction of this type of photography and it's unavoidable! The last method to make a panorama is the most advanced method: the one said by photo stitching. You'll take a series of pictures slightly overlapping each other - about 1/3 between two pictures - as in the example below and a photo panorama software will stitch them together so as to make a nice panorama without visible stitch... or so it should be! This method that gives the best results can be done with a hand-held camera thus very easily or with specific equipment enabling to get a constant result and almost always even better. Those six photos taken with a 35mm were stitched using Autopano Giga. Note how vertical lines are perfectly straight while the photos have been taken with the body tilted downwards. Two photos at least must be stitched but you can stitch many more like the 2,346 photos of the project paris-26-gigapixels.com. Drawbacks: more difficult to implement if you want the best quality - you may need to buy specific equipment (a panoramic head) and panorama software (although it is not compulsory to get an excellent quality).